Brochures, banners, books – Find a wealth of resources for use in your community. California Trees: California ReLeaf’s newsletter, California Trees, features news and commentary on urban forestry programs and concerns around the state. Subscriptions are free and are delivered via US Mail. The Power o f Trees: Changing our world one tree at a time: California ReLeaf 2-page flyer about how urban trees help our families, our communities, and our world. Urban Greening Brochure: In 2010, California ReLeaf compiled and published the Urban Greening brochure with funding provided by the California Department of Forestry and Fire Protection. This brochure highlights the multiple benefits of urban greening for water, energy and air quality, public health, and local economies. 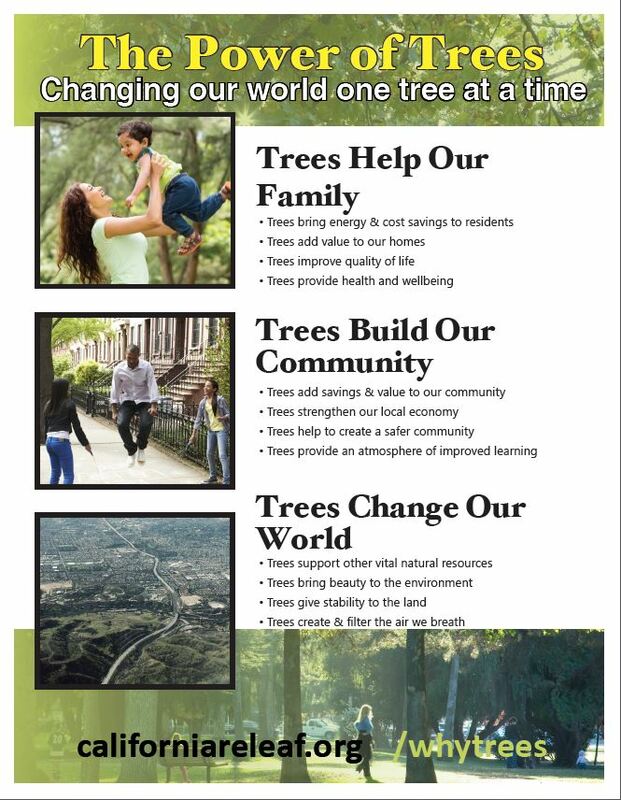 Trees for People: Urban Forestry 101: An excellent one-page sheet from the U.S. Forest Service’s Urban and Community Forestry Department highlighting the benefit of trees. Urban & Community Forestry at a Glance: From the CAL FIRE Urban & Community Forestry Program, a helpful resource two-page document demonstrating the economic and environmental impacts of urban forestry in California with other statistics about our Golden State. Nursery Standards and Specifications: This 2009 document provides specifications for selecting and specifying quality nursery trees in California, with a focus on container stock. Published by CAL FIRE in partnership with the Urban Tree Foundation. Trees Pay Us Back: The Urban Ecosystems and Social Dynamics Program of the U.S. Forest Service’s Pacific Southwest Research Station has produced several brochures that highlight the economic benefits of trees in specific California regions, including the Southern California Coast Region, the Northern California Coast Region, the Inland Valleys Region, and the Inland Empire. Each of these cue cards is available as a 3 ½” x 8 ½” laminated card for distribution. Cards are available free of charge to dues paying California ReLeaf Network members, or to other individuals or organizations for the cost of shipping and handling. Email California ReLeaf to order cue cards.